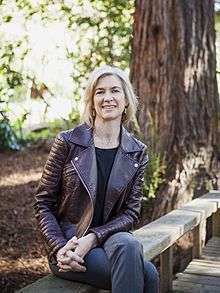 Jennifer Anne Doudna (born 19 February 1964) is a Professor of Chemistry and of Molecular and Cell Biology at the Department of Chemistry and Chemical Engineering of the University of California, Berkeley. She has been an investigator with the Howard Hughes Medical Institute (HHMI) since 1997. Doudna earned her Bachelor of Arts degree in Chemistry from Pomona College in 1985, and her Ph.D. in Biochemistry from Harvard University on ribozymes for research supervised by Jack W. Szostak. She did her postdoctoral research work with Thomas Cech at the University of Colorado, Boulder. While in the Szostak lab, Doudna reengineered the self-splicing Group I catalytic intron into a true catalytic ribozyme that would copy RNA templates. Recognizing the limitations of not being able to see the molecular mechanisms of the ribozymes, she started work to crystallize and solve the three-dimensional structure of the Tetrahymena Group I ribozyme in 1991 in the Cech Lab and continued while she started her professorship at Yale University in 1994. While the group was able to grow high-quality crystals, they struggled with the phase problem due to unspecific binding of the metal ions. One of her early graduate students and later her husband, Jamie Cate decided to soak the crystals in osmium hexamine to imitate magnesium. Using this strategy, they were able to solve the structure, the second solved folded RNA structure since tRNA. The magnesium ions would cluster at the center of the ribozyme and would serve as a core for RNA folding similar to that of a hydrophobic core of a protein. Doudna was promoted to the position of Henry Ford II Professor of Molecular Biophysics and Biochemistry at Yale in 2000. In 2002, she accepted a faculty position at University of California, Berkeley as a Professor of Biochemistry and Molecular Biology so that she would be closer to family and the synchrotron at Lawrence Berkeley National Laboratory. This initial work to solve large RNA structures led to further structural studies on the HDV ribozyme, the IRES, and protein-RNA complexes like the Signal recognition particle. Her lab now focuses on obtaining a mechanistic understanding of biological processes involving RNA. This work is divided over three major areas, the CRISPR system, RNA interference, and translational control via MicroRNAs. The CRISPR/Cas9 was awarded a patent by a law firm in Chicago. Doudna was a Searle Scholar and received a 1996 Beckman Young Investigators Award, the 1999 NAS Award for Initiatives in Research and the 2000 Alan T. Waterman Award. She was elected to the National Academy of Sciences in 2002 and to the Institute of Medicine in 2010. 2014 Dr. Paul Janssen Award for Biomedical Research and Breakthrough Prize in Life Sciences, both shared with Emmanuelle Charpentier. 2015 Named one of Time Magazine's 100 most influential people in the world, together with Emmanuelle Charpentier. 2015 Princess of Asturias Awards, together with Emmanuelle Charpentier. 2015 Gruber Prize in Genetics, with Emmanuelle Charpentier. 2016 Canada Gairdner International Award, with Emmanuelle Charpentier and Feng Zhang. 2016 Elected a Foreign Member of the Royal Society (ForMemRS). ↑ Doudna, Jennifer (2015). "Genome-editing revolution: My whirlwind year with CRISPR". Nature. 528 (7583): 469–71. doi:10.1038/528469a. PMID 26701037. ↑ "Jennifer Doudna – American biochemist". Encyclopædia Britannica Online. Retrieved 13 November 2015. ↑ Pollack, Andrew (May 11, 2015). "Jennifer Doudna, a Pioneer Who Helped Simplify Genome Editing". New York Times. Retrieved May 12, 2015. 1 2 3 4 Marino, M. (2004). "Biography of Jennifer A. Doudna". Proceedings of the National Academy of Sciences. 101 (49): 16987. doi:10.1073/pnas.0408147101. ↑ Doudna, Jennifer Anne (1989). Towards the design of an RNA replicase (PhD thesis). Harvard University. OCLC 23230360. ↑ Rajagopal, J; Doudna, J.; Szostak, J. (May 12, 1989). "Stereochemical course of catalysis by the Tetrahymena ribozyme". Science. 244 (4905): 692–694. doi:10.1126/science.2470151. PMID 2470151. ↑ "Jennifer A. Doudna, Ph.D.". HHMI. Retrieved August 26, 2012. ↑ Powell, Kendall (2005). "Renaissance Women". HHMI Bulletin. Retrieved August 26, 2012. ↑ Cate, JH; Gooding, AR; Podell, E; Zhou, K; Golden, BL; Kundrot, CE; Cech, TR; Doudna, JA (September 20, 1996). "Crystal structure of a group I ribozyme domain: principles of RNA packing.". Science. 273 (5282): 1678–85. doi:10.1126/science.273.5282.1678. PMID 8781224. ↑ "The Doudna Lab". Retrieved August 26, 2012. ↑ "Jennifer Doudna TED Talk". ↑ Wear, Maggie (2013). "Doudna wins new Mildred Cohn award". ASBMB Today. ↑ "Paul Ehrlich and Ludwig Darmstaedter Prize 2016 for Charpentier and Doudna". Press Office of the Paul Ehrlich Foundation. Retrieved 14 March 2016. ↑ "Heineken Prizes - Jennifer Doudna". Royal Netherlands Academy of Arts and Sciences. Retrieved 10 May 2016. ↑ "The 2016 HFSP Nakasone Award goes to Emmanuelle Charpentier & Jennifer Doudna". Human Frontier Science Programme. Retrieved 9 September 2016.